I was surprised when I looked at my oil dip-stick after 8,000 miles since the last change (now at 28,000 miles), that the oil level was still at the max point, and the oil looked very clean, almost hard to read on the dip-stick. I will be changing the oil soon and am tempted to skip changing the filter. If the oil is so clean I suspect the filter is also. Before you get too critical of me I should point out I am 84 years old but still enjoy doing a little car maintenance, but I don't bend as well as I did 50 years ago. Also, for years I have used the suction method (Top Sider vacuum pump) to "drain" the old oil. This is a very easy method to use. A few years ago, after using the vacuum method, I removed the drain plug and not a single drop of oil came out. I think all engines are now designed to work with vacuum evacuation through the dip-stick tube. My question is .... has anyone carefully inspected the filter after an oil change to determine the amount of contaminants that were caught? You'll be fine with 20K miles on a filter. I had used some VW/Audi filters on other vehicles and even they said 20K mi/30K km on the side of the filter. A modern Toyota engine isn't going to burn or ruin oil, as you've observed on the dip stick. I would change the filter when the oil is changed. After investing in comparatively expensive synthetic oil, the cost of an oil filter is comparatively inexpensive, and while I don't have a 4.4 RAV I suspect that an Owner's Manual suggested oil change includes a new filter. Also there is no guarantee that the existing filter will do its job for another c.10K miles and will not end up sending unfiltered oil via the bypass valve. Congrats at still being car maintenance active at 84 and with a background in engineering! I would change the oil filter when you change the oil. Just my 2 cents. I change my oil at 5k miles. am I missing something? 8-20...wtf maybe I need to hang out more on this forum. I skipped a filter once and filter didnt look bad at all,but changed it on account that i just skipped it and got 10k miles on filter. Here is the strange part,went to skip it again another time so took it out anyway just to look at it and get that extra bit of old oil out and the filter was filthy. 5k oil change and filter at least for now. I would not go 20,000 miles on an OEM filter. It is strictly a cellulose filter media and debris "caking" has a far better chance of clogging it up since it basically is one dimensional filtering. They simply are not designed to go to a 20,000 mile interval like a quality synthetic oil filter can. You would want to go with a full synthetic filter such as Royal Purple (don't know if they have a cartridge style filter and there for a viable filter for a Toyota) Amsoil synthetic, Fram Ultra, Wix XP/Napa Platinum, and Bosch DistancePlus These filter can hold more debris since it a a 3 dimensional synthetic filter and particulate/dirt can embed deep in the filter and not just on the outside or surface of a less describable cellulose filter media. I myself like Fram Ultras, because you can get them at Walmart. I run them on all my car's, including my wife's Rav4. They are around $9.00 for a great filter that dose not in anyway resemble the lack of quality Fram's cheap filters carry. Fram makes Royal Purple's filters and they are considered #1or #2 for filtering particulate or the lowest ISO particulate count readings (ISO 4406:99 )in some mid level advanced filter tests. There is a guy on Bob's the oil guy site who ran an Amsoil synthetic filter for I think 37,000 miles and did oil change changes every 7,000 miles and leaving the Amsoil oil filter in untouched while doing ISO 4406:99 tests to figure out when his filter would go into by-pass and I think it went into by-pass at around 32,000 miles. Thanks to all who responded. In the last day or two I have researched a little and find 20,000 mile oil filter changes are recommended by some manufacturers. Honda for one on at least some models. The Toyota filter is surely compatible with synthetic oil, since that is what Toyota uses in the newer RAV4, so I am not concerned with that (Toyota is just as diligent as Honda). I wonder why on post #5 it was reported once after skipping the filter change the filter still looked clean, and another time it looked dirty. There may have been a change in driving conditions (winter, short runs, non synthetic oil used, etc. ), Who knows?. My plan is to skip this filter change and go for 20,000 miles, at which time I will do a close inspection. My driving conditions are ideal, with no short trips, and I have full confidence no harm will be done. It is sometimes difficult to realize the improvements made to automobiles over the last twenty or thirty years. We used to replace spark plugs and engine coolant frequently, and using a quart of oil in 1,000 miles was normal, along with greasing about a dozen fittings . When I first started driving 1,000 miles was the oil change interval, until Valvoline came out with their 2,000 mile oil. After 50,000 miles the valves needed grinding, and maybe a lot more. Modern manufacturing, engineering and materials (especially lubricants) have sure had a positive effect. To have such clean oil after 8,000 miles, and still at the "max" mark on the dip-stick is amazing. If you want to test how your oil is doing you could use your vacuum pump to put a little in one of those oil analysis test kits available on line. Takes about a week to get the results. Then you know for sure. I change the oil and filter on my Rav about every 7,000 miles. I bought 10 Toyota filters off of Ebay for $40. I also watch when Mobil 1 or Pennzoil have rebates and buy the oil whether I need it at the time or not. I believe in changing the filter at the time I replace the oil. It just gives me peace of mind. Mobil 1 and Pennzoil have rebates at this time. AMSOIL synthetic media oil filters, are made by WIX in their Platinum XP line and repackaged. - I wouldn't trust anything with the name FRAM on it. 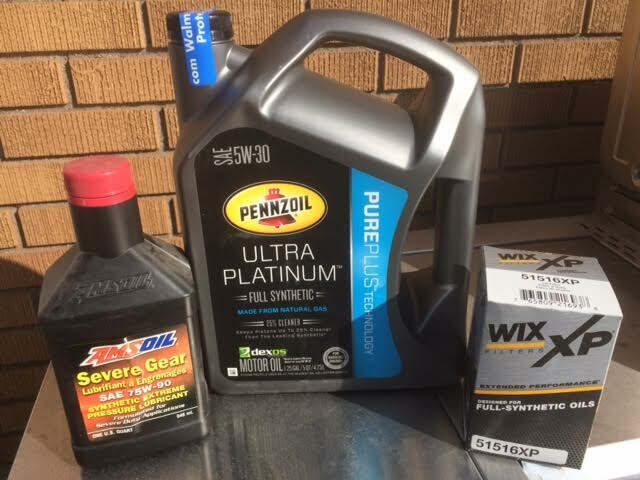 I've also switched from expensive AMSOIL oil and now purchase Pennzoil Ultra Platinum made from 99.9% clean Natural Gas base stock. I supply my garage, with oil and filter / RAV4 goes on hoist for fluid change.